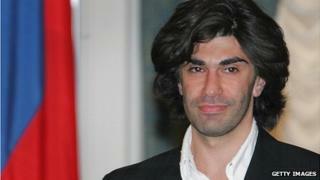 Ballet dancer Nikolai Tsiskaridze has asked a Moscow court to annul official reprimands from the Bolshoi Theatre. Mr Tsiskaridze accused the theatre of using an acid attack on its artistic director to conduct a "witch hunt" against him. Sergei Filin was attacked with sulphuric acid in January, leaving his eyes damaged. Dancer Pavel Dmitrichenko and two alleged accomplices are currently awaiting trial for the attack. Mr Tsiskaridze believes that the Bolshoi is trying to drive him out. Multiple reprimands can be grounds for dismissal under Russian labour law. One of the two reprimands against Mr Tsiskaridze is for giving an interview without permission from the theatre's press service. The judge did not provide details of the other. Mr Tsiskardize's lawyer said there were no grounds for disciplinary action. In February Bolshoi artistic director Anatoly Iksanov said the acid attack was a "natural result of the mayhem whipped up... by Nikolai Tsiskaridze". Mr Tsiskaridze later hit back, accusing Mr Iksanov of trying to damage his reputation and settle scores. He said the attack was being used as justification for a "witch hunt to get rid of all the people they don't like". After a series of operations, Mr Filin has been moved to Germany, where doctors have expressed hope that further treatment may be able to restore good vision. In March, principal dancer Mr Dmitrichenko admitted to discussing the attack but denied ordering the use of acid. Mr Tsiskaridze, a principal dancer and teacher, has been at the Bolshoi since 1992.